Before I start, I have to include a picture I left out of Saturday’s post. 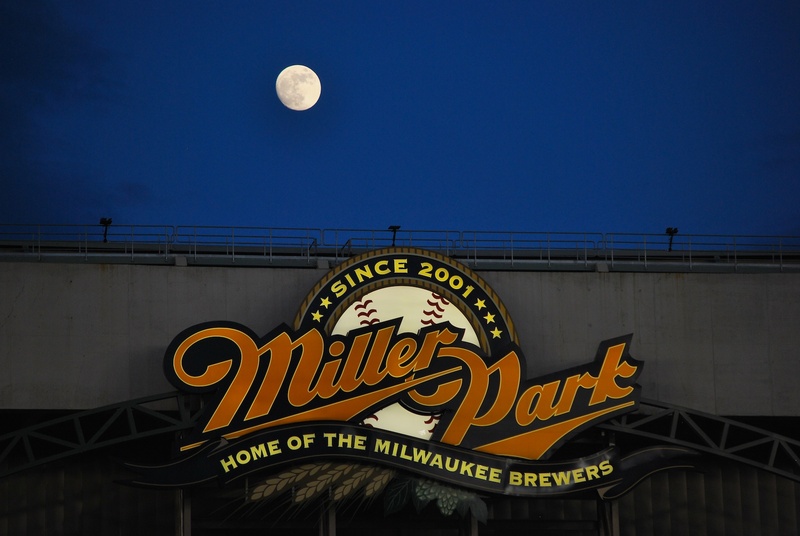 Towards the end of Saturday’s game, the moon emerged from behind the scoreboard. I don’t know if I would’ve noticed, but Victoria mentioned it and the people in front of me were also taking pictures with their cell phones and cameras. It took some time to figure out the correct settings for the shot, but I think I got the best picture I could. Ok, back to Sunday. We got up at Victoria’s Aunt’s house at 8:25, and I worked on Saturday’s post until 10:00. We left her Aunt and Uncle’s place in Sussex at 10:45, stopped at Jimmy John’s on Bluemound, and got to the Cooper Lot by 11:25. I walked around and talked to more people about the mission and Be The Match, and made my way inside just after 12:15. I got the game number picture taken in section 232, and it took forever to get my camera’s settings just right. I set it to manual, thinking I could change all the settings the way I wanted to, but that wasn’t the case. I wanted a fast shutter speed (since it was really sunny behind me), but I also wanted to have the flash on (because I wanted to be able to see my face). I didn’t get what I wanted, because my camera doesn’t allow for the flash to be on with a shutter speed of 1/1000. I settled for the following, and as you can see the sky is completely white as a result. The sky was actually blue, and I wanted to capture that, I guess you can’t have it all. After spending 10-15 minutes trying to get the picture I wanted, we went down to the team store to meet up with Nathan. He works with Jill Aronoff, the director of merchandising. We talked about the iPhone case I had gotten back in May, and I pointed out a few t-shirts that I thought would like. I’ll probably get them at some point during the home stand. We got to our seats just before the anthem, and settled in for the game. On Sundays the Brewers have the PNC Major League Moment promotion. Kids 6-13 (well, their parents) can enter at participating PNC Banks to make an on-field appearance with a Brewers player during the national anthem. 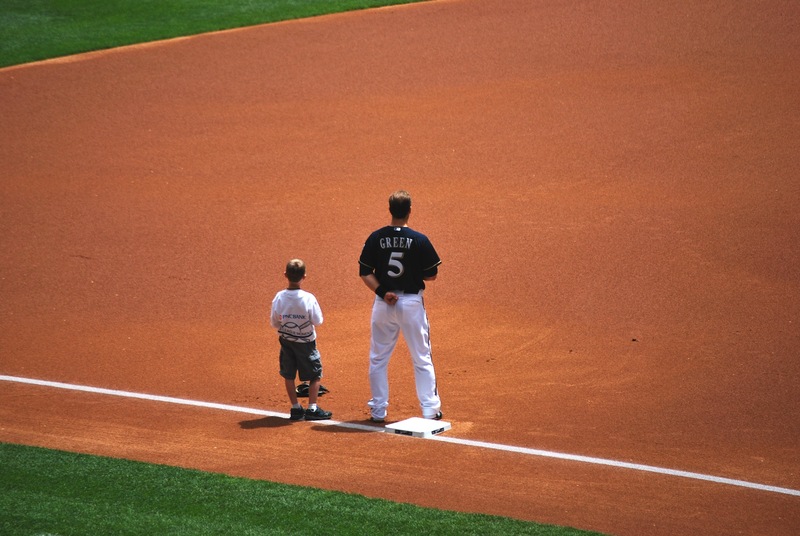 I got a picture of Taylor Green standing by third base with his new friend. If you would’ve watched the game on opening day, fell asleep for 52 games, and then saw the starting lineup from Sunday, you wouldn’t have known what was going on. It featured three familiar names and six that most people (even baseball fans) haven’t heard of. Weeks, Chart and Morgan were the familiar faces, and the other six were either Brewers reserve players, from the minor league system, or started the season on another team’s roster. The Brewers wasted no time getting a lead, and scored two runs in the bottom of the first inning. With two outs Green doubled to score Morgan, and then Weeks singled to score Green. The Pirates scored a run in the second, then three in the fifth and one in the sixth. Three home runs accounted for those last four runs, and the Pirates had a 5-2 lead going to the bottom of the sixth. Nyjer Morgan homered in the sixth for his second home run in three days, and Martin Maldonado hit his first career home run in the seventh. 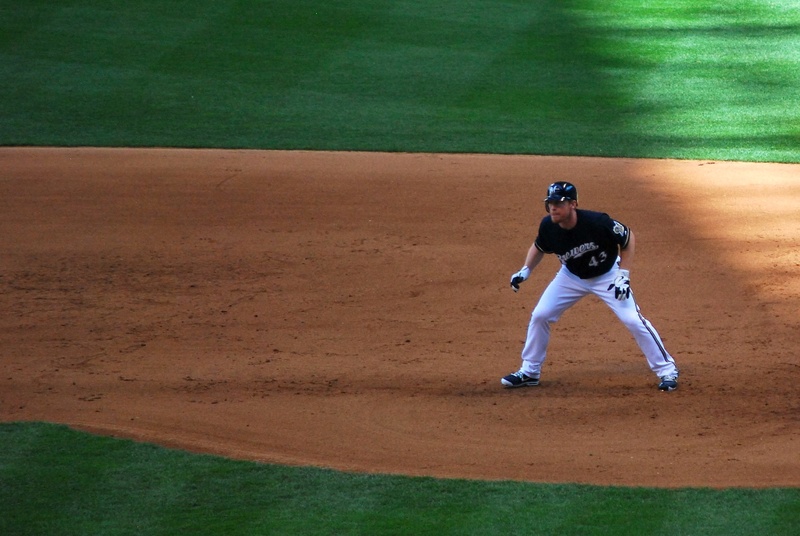 As he neared third base coach Ed Sedar I took a picture to celebrate. The Pirates clung to the one run lead heading into the bottom of the eighth. 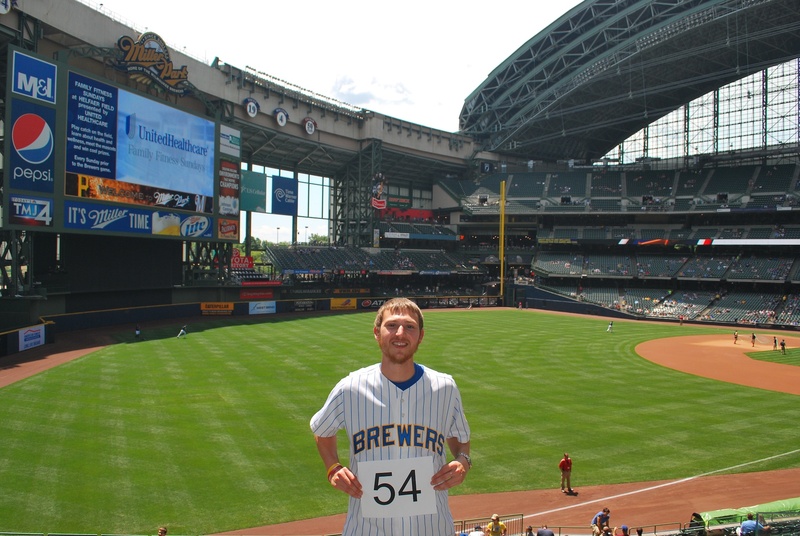 With two on and two out the Brewers called on a familiar face for some heroics. 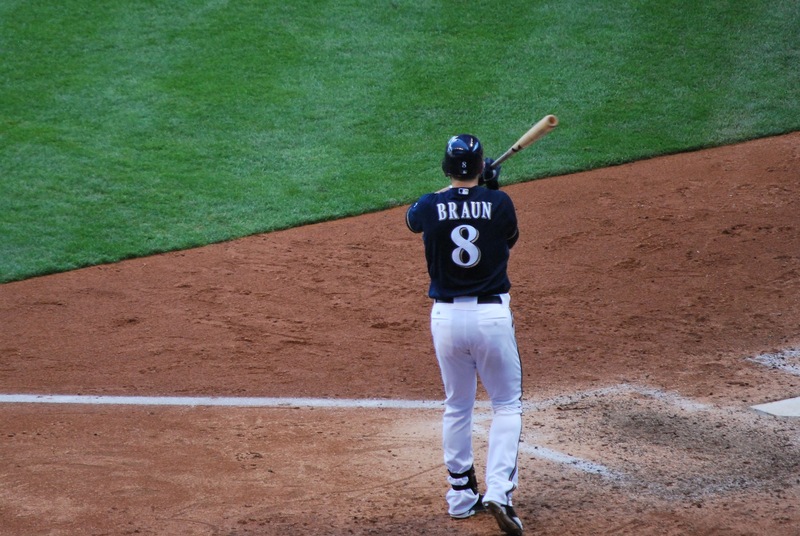 Braun didn’t start because he was nursing a strained Achilles, but he was available to pinch hit. On the first pitch he saw, Braun drove one to right that fell about five feet short of the right field wall. It would’ve given the Brewers a two run lead going into the top of the ninth, with a real good chance of winning the series. It wasn’t meant to be, though, and Axford came in to try and keep it a one run game. Clint Barmes lead off the ninth with a solo home run, and the lead grew to two runs. It wasn’t looking good going into the bottom of the ninth, with the Pirates having a good closer in Joel Hanrahan. Brooks Conrad, however, deposited the second pitch of the half inning into the Pirates bullpen in right, pulling the Brewers to within one. It was the seventh home run of the game and all of them were under 400 feet, with only one eclipsing 390 feet. George Kottaras pinch hit in the pitcher’s spot after a Maldonado fly out. When the count went to 3-0 I told Victoria that if Georgie gets on Roenicke will likely pinch run with a starting pitcher. I knew that Kottaras still wasn’t 100%, or he probably would’ve caught a game besides the Wolf start. 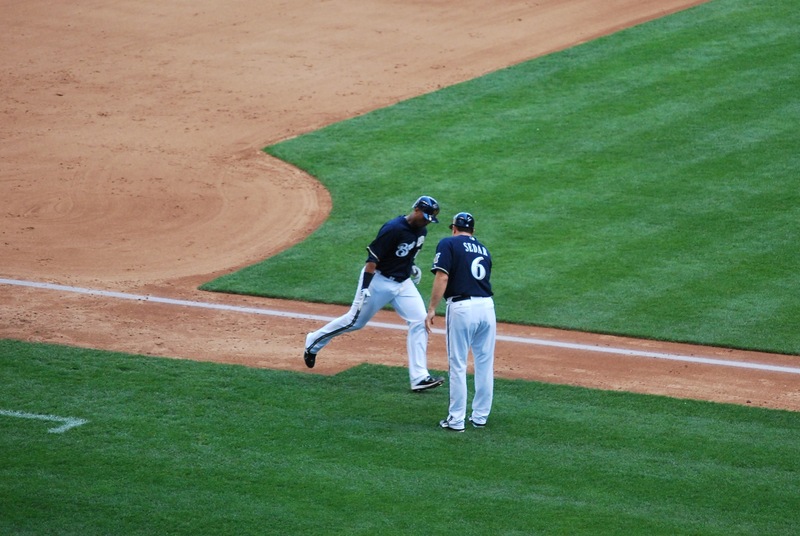 Sure enough, after he walked on five pitches, none other than Randy Wolf came in to pinch run. The Brewers had already used up their bench in other pinch hit spots, so they really didn’t have any other options. Norichika Aoki came to the plate representing the winning run, but on the fourth pitch of the at bat he grounded into a 4-6-3 double play. The Pirates took the game and the series. Final Score: Pirates 6 – Brewers 5. One last thing: every Sunday the sausage race deviates from the norm, and it involves some little sausages. 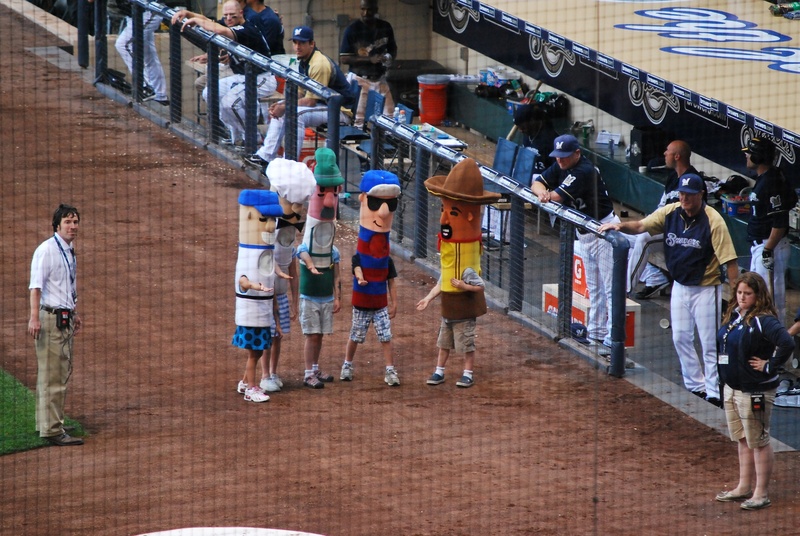 It’s a relay race, and I got a picture of the little guys (and gals) as they wait their corresponding costume wearing encased meat. The full size sausages pace it so the race can be decided by the little sausages. Little Chorizo must not have gotten the rule book, because he took off before big Chorizo got there, and he wound up with the victory. I had chosen the Bratwurst because he was the tallest, but a full second head start is hard to overcome (Bratwurst came in a close second). It’s almost midnight, so I’m going to bed. I have a physical therapy appointment and an occupational therapy appointment in the morning. I’m hoping the physical therapist can do something about my knee, because it’s starting to get worse and I’m not sure what I should do. I don’t know if I’ll be posting about off day number six, but I’ll be back at it following Tuesday night’s game vs. the Cubs.